The proposed Marjory Stoneman Douglas High School Public Safety Act is named after the high school in Parkland, Florida, where 17 students and staff were shot dead on Feb. 14. Florida's Senate will vote on Monday on some gun-related measures in response to last month's deadly school shooting, including a proposal to train and arm teachers, but lawmakers have rejected a call by some students to ban assault weapons in the state. Student survivors of the Parkland shooting have become prominent advocates for stricter gun laws, with some calling for a ban on semiautomatic assault-style rifles of the sort used in that attack and other recent U.S. mass shootings, as well as high-capacity magazines. The state Senate rejected such a ban in a vote held over the weekend. The Senate bill echoes many proposals made by Governor Rick Scott, a Republican, since the shooting, including new powers for police to temporarily confiscate guns from people deemed to be dangerous by a court. The bill would raise the minimum age for buying any kind of gun to 21, from a current minimum of 18 for all weapons but handguns. It would also ban bump stocks, which allow semiautomatic rifles to fire like fully automatic machine guns, and mandate a three-day waiting period for the purchase of all guns, not just handguns. The Senate's Republican majority is expected to vote to pass the bill, Katie Betta, a spokeswoman for Senate President Joe Negron, said. The measure will then move to the legislature's Republican-controlled House of Representatives for a vote. The bill would require the governor's signature to take effect. 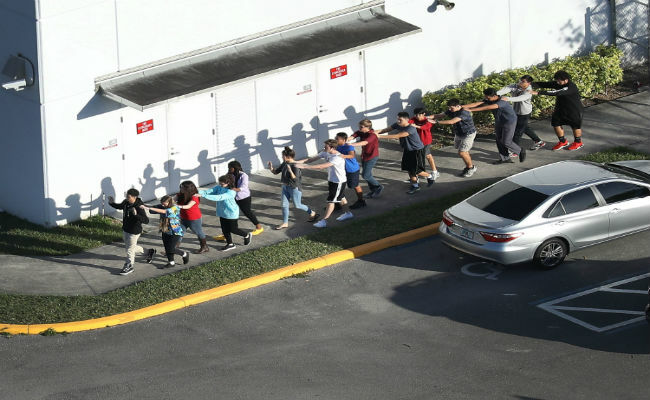 Scott has said he opposes one of the bill's more scrutinized measures: allowing county sheriffs to set up voluntary training programs to arm teachers to prevent future massacres, similar to an idea also proposed by U.S. President Donald Trump. Sheriffs who choose to set up a so-called "school marshal" program would have to ensure that any teacher or other school staff member who opts to become one has a valid license and has completed 132 hours of shooting and safety training. The bill says that "a school marshal has no authority to act in any law enforcement capacity except to the extent necessary to prevent or abate an active assailant incident on a school premises." Some families of the victims from Douglas High School said they would hold a news conference on Monday afternoon about the legislature's efforts, which would increase funding for school safety and mental health measures.